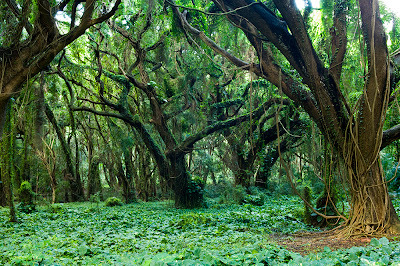 Plants on Hawaii have many different origins, some indigenous, others alien. Endemic plants are those species that evolved in isolation on the Hawaiian islands and are found nowhere else. Indigenous plants are those that colonized the island before the arrival of humans, such as those that arrive on the winds or over the ocean. Plants introduced by the first travelers to Hawaii, the Polynesians, are regarded as native. Most of these plants have important uses for food, fiber, medicine, and spiritual significance. Alien species are the plants introduced after the late 1700s since contact with European explorers. Some plants were brought purposely, many were accidental weed introductions. Many alien species are escaped cultivated plants and fruit trees, and many are causing damage to the native and less hardy Hawaiian plants. Here we'll discuss three trees very foreign and exotic for us: starfruit, noni, and Java plum. Starfruit (Averrhoa carambola) is a tropical fruit you might be able to find in the supermarket at home. It is native to southeast Asia and India. It is likely a recent introduction to Hawaii as a fruit tree that has escaped into the wild. It is evergreen and will produce fruit all year in tropical, wet forests. 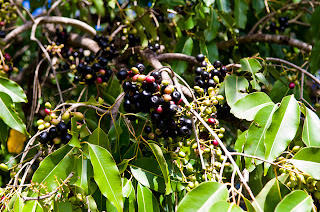 We encountered one tree in the woods on Maui, and saw several planted on Kauai in people's yards, as well as the ripe fruit for sale at the local Sunshine Markets. 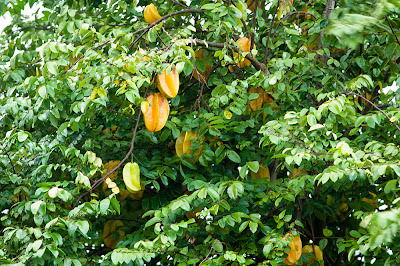 Starfruit is a bushy tree has compound leaves with 5-11 leaflets that are sensitive to light and will fold up at night. Each leaflet is bright green, ovate, smooth on top and slighly hairy and lighter colored on the underside. Purplish-streaked flower clusters and fruit are present at the same time, continually producing. The fruit has a thin, waxy skin that is edible, and ripens to yellow from a light green. The taste is difficult to describe, depending on the ripeness of the fruit. It can taste like grapes, apples, or citrus with varying degrees of sweetness. 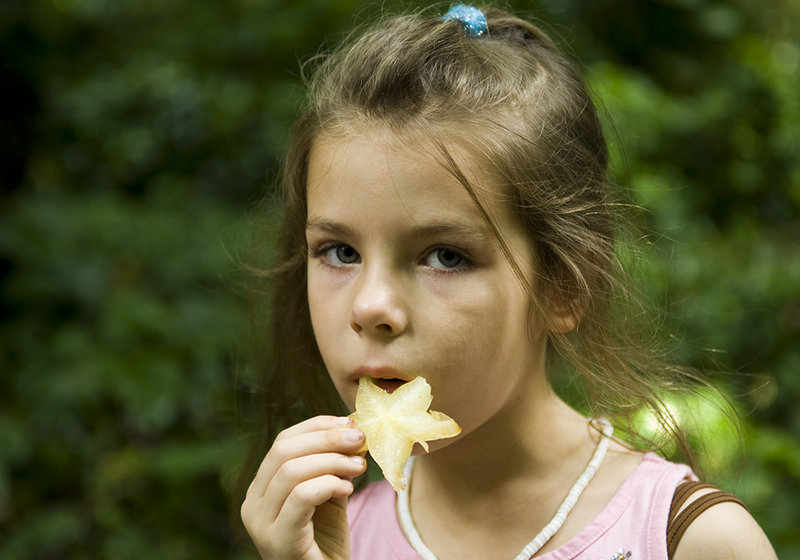 Starfruit is eaten raw, sliced along the fleshy midribs to display its star shape, or made into chutneys or juiced. The fruit are high in vitamin C and contain oxalic acid. Robert recognized the noni (Morinda citrifolia) fruit I pointed out to him at once. He is familiar with some of the medicinal claims of the juice of the noni, while I remain skeptical. 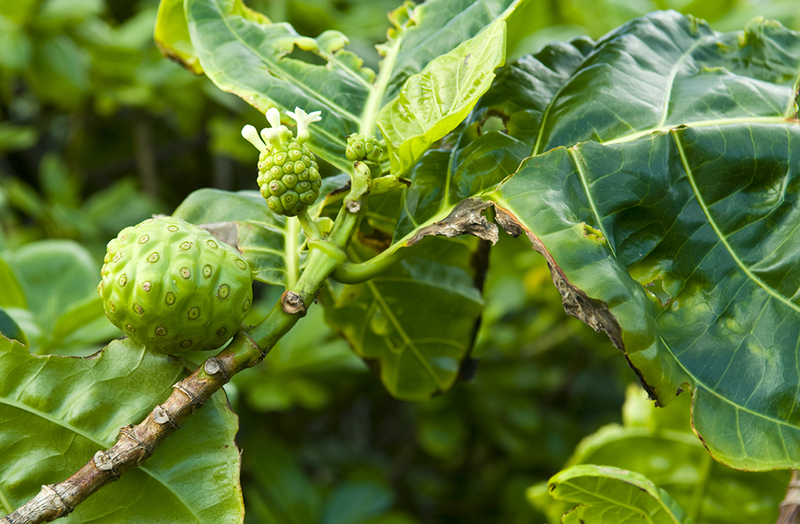 Noni is a Polynesian introduction to Hawaii, originally from southeast Asia. It has many medicinal uses, its roots are used to dye fibers, and it can be eaten as a famine food. 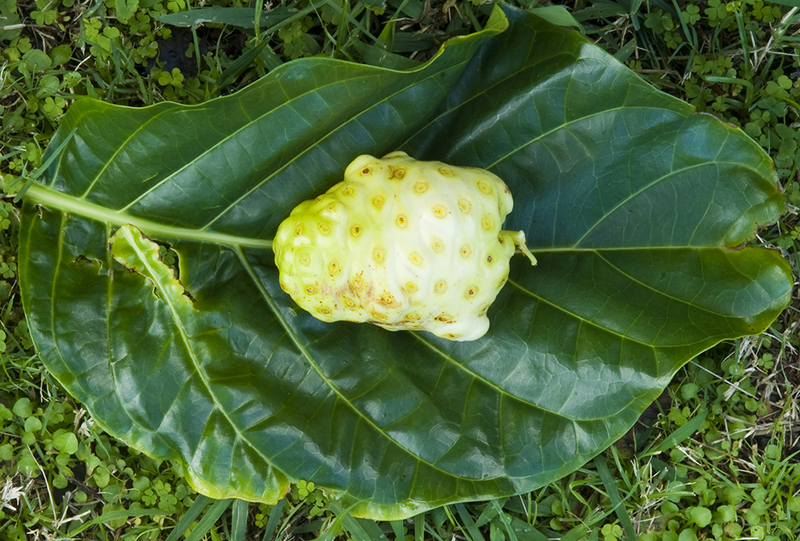 Noni grows in shady, wet forests and among lava-strewn coasts as a shrub or small tree. It has large, glossy green and deeply veined leaves that seem much too big for such a spindly trunk. It produces white flowers and fruit all year. The fruit looks like a giant mulberry, a lumpy oval about the size of a grapefruit with spots on the outside in each many-sided section. The fruit ripens to white from light green, and smells awful when ripe, like vomit or bad cheese. The Hawaiians only ate the fruit as a last resort, since there were other, better tasting fruits available. Robert did add a bit of a ripe one to a smoothie, but I thought it was too gross to drink. Java plum (Syzygium cumini) was likely introduced to Hawaii in the 19th century for its fruit, and is now considered an invasive. It is spread by birds that eat the fruits and spread the seeds. Java plum is native to India, Bangladesh, Nepal and Indonesia. It makes massive amounts of purple fruit in autumn and winter that stains the roads and any unlucky car parked beneath a tree. It is a fast growing tree with lance-shaped leaves that provide plenty of shade. It produces small, white flowers in March, and fruit in June. The fruit is abundant, ovoid, ripening to purplish-black from green. All of the Java plums we sampled were incredibly astringent with a bit of a resinous aftertaste, but it was suggested to us that different trees have different levels of sweetness. The ripe fruit can be eaten raw, or juiced and made into ice cream. It is very informative post. Robert recognized the noni fruit I pointed out to him at once. I impressed by that. Thanks for sharing posting. I've never been to HI; I may have to visit in sometime in the next few years.